Emil is an NPC in Nier: Automata. Resembles the companion character who accompanied the player in the NieR: Gestalt / NieR: Replicant, but may actually be a copy. He harbors latent magical power, but most of his memory is gone due to the long years that have passed/making so many copies of himself. "This mysterious creature emerged from inside of a machine lifeform and set up a shop afer obtaining a new body. While he calls himself Emil, his true identity is a mystery. Once he discovered who had been stealing from his room, he was incited to fight. But after being defeated, he was reduced to tears by the realization that only power matters in this world." When you speak to Pascal at his village, after completing the fight against A2, Emil will start appearing on the map. He can be found in the northeast corner of the City Ruins, driving around in a van. Shoot him with your POD to make him stop and speak to him for a hint about his home. Head back to the commercial district where you access the Forest Zone and interact with the Lunar Tear flower. Emil will appear and ask you to look for other Lunar Tears and the Side Quest Emil's Memories will begin. 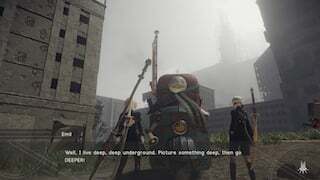 During your second playthrough as 9S, after unlocking the Forest Zone, you can go to the City Ruins and go into the of pipe just above the City Ruins: Cave location. (Not the one with the ladder down to the caves, but the one between the two ruined buildings.) Open this door using the Elevator Key you had obtained via the quest Emil's Memories. Inside, you will be at "City Ruins: Deep Cave". 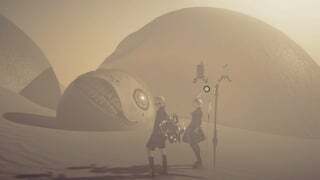 Please note that the door leading to Emil's Residence will be locked if you go there on a second playthrough, and requires you to talk to Emil at the desert entrance again for it to be unlocked. Explore the deep cave, unlock some unit data for Enhanced Machines (lvl 50) and items such as Silver Ore and Meteorite, a Locked Chest, Titanium Alloy, Memory Alloy. and Pyrite. Eventually you will arrive at a gate and to Emil's Residence. Go inside and pick up Emil's Mask. Return to the surface, find Emil and talk to him again. He will comment and say someone stole from him and now he has put everything in a secured chest. Go back down the elevator in the pipe to the Deep Cave, and unlock the special Locked Chest that now appears in Emil's Residence. You will obtain Emil's Head. When you exit the room, Emil faces you as a Level 99 Boss. The best way to defeat him is to have Auto-Heal and Anti Chain Damage Chips on, and 2B on aggressive. Focus on dodging the projectiles and trying to hack Emil. 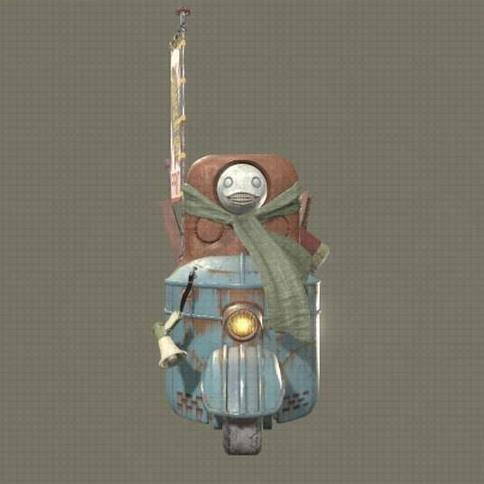 Emil will spawn randomly in one of three locations; near the Desert Zone entrance, the City Ruins: Near Factory access point, and outside the Resistance Camp. He will sell different items depending on where you find him. He has two kinds of items in stock per route, either chips or weapons and materials. Making him switch routes is - for now - quite unreliable. Teleporting in and out of access points seems to work. Another fairly good approach is to walk between the desert zone and halfway to the Desert: Camp access point via moose, then check your map for his icon. It is faster than teleporting and has a good chance of making him switch routes. Can be fought as an optional super-boss. Emil's stock depends on the location he has been stopped, so if he passes through the location the player need, they can wait for him to come back there instead of trying to spawn him again. Attempting to hack Emil as 9S in the world map will result in 9S being briefly stunned. I know everyone wants him to be the original or &apos;true&apos; Emil, but I&apos;m fairly certain he isn&apos;t. The archive entry says he&apos;s the real one, but the same entry also says he defeated his clones while making no mention of 2B, 9S, or A2. Also, he tells us he became more fragmented with each clone created, and since we don&apos;t know the specifics of the cloning process he used, we can assume the original likely broke himself apart in order to make his armies of clones. But in general, dialogue is more explicit than archive entries which are basically summaries. Unlike Soulsborne, archives in any other game are supplementary readings written after the dialogue. So there&apos;s a good chance that him being the &apos;true&apos; Emil slipped through proofreading & editing, whereas dialogue would have been inspected more thoroughly, probably by Yoko Taro himself. And really, it&apos;s just wishful thinking wanting this Emil to be the original. That&apos;s like saying he shouldn&apos;t have changed into his skelly balls form after fusing with his sister. But until someone asks Yoko Taro for a confirmation, I&apos;ll keep to my stance that this Emil is another clone. But really, what difference will being original or not make? Like the Emil Heads say in their memiors, he&apos;s still alive after 500 years. So it&apos;s pretty much given that Emil is here to stay. I&apos;m almost 100% certain there is a bug that can prevent Emil from moving from his initial desert spawn spot, at least on the PC version. I&apos;ve done a fresh 2B playthrough twice (i.e. no chapter select), but the first time Emil moved around like normal. The second time, I tried all manner of tricks online and quest flagging through probably 100+ Emil respawns, but nothing worked. The closest thing to a change was stealing his mask, at which point he changed his inventory from crafting materials to chips, but he still spawned at the desert spot. If you&apos;re trying to accomplish as much as possible during your first 2B playthrough, be sure to save before and immediately after the carrier support mission in case you have to revert. So it seems this is really the original Emil based on the concluded quest events and unit data gained from completing the quest chain by winning the second encounter fight (I know some are unsure but the game seems to be pretty blunt about it at that point). Seems like then the original/true emil finally dies after many years of toil but manages to find peace at the end hoping to be reunited with his friends long gone. Its important to note the weapon story though on the Emil Heads weapon; it seems to take place after the events of Nier Automata. It seems further copies of emil spawned well after the original&apos;s death (going under the assumption his death will be a canon event) so some form of Emil will continue to exist. I guess he&apos;s sort of the mascot for the series now so couldn&apos;t get rid of the character entirely. Will be interesting to see what place he could have in a future game. Emil seems to change his position if you buy or sell something. From what i can tell Emil changes inventory based on what play-through/ending you are on. I have only checked this once so far so it still needs more information to be confirmed. Switched to Route C/D after trying to get the item shop to spawn in A/B for like an hour. It STILL was the plug-in chip shop, but-! Instead of leaving and trying to get him to respawn, I instead, talked to him again and his inventory had changed on the spot. People seem to be having a lot of trouble with getting him to swap inventories, and it makes me wonder if it&apos;s just on a global timer or something. Some check in the scripting like "after routes A/B if your playtime hours is odd spawn plugins, if it&apos;s even spawn items". This is not the case, the unit data you get after the desert fight confirms that he is the "true emil". How the hell do you initiate Emils Determination? I got 100%, weapons lvl 4 on them all, beat him in his dungeon but he does not appear in the mall, in the desert or anywhere. And when i talk to him in the city he just says "someone broke in". Well, dun, someone broke in and killed you you dumb ball. Some (useful?) observation: Emils high-level shop, option to buy either good materials or two weapons and a dress module, switches after you restart the game client completely. This isnt backed up by any facts, but after running around him for good 4 hours, and him selling only 3 out of 4 total options, i gave up and when i came back that evening, he sold the high-level materials on the first try. -After that, whenever you reload or teleport to city ruins area he will ( mostly) spawn near Engels , under the broken bridge in the big area infront of City ruins near factory point and roam around city ruin but never get near the resistance camp area. There you must fast travel to City ruins near factory , wait for him to go nearby and hit him there, talk to him until he said you being too aggresive. - Now warp to city ruins near tower and start run toward the mall, cross the wooden bridge into the mall, now heading back to the city and cross the bridge again, run until you get near the other side of the bridge, turn on the map and emil should be spawn near the entrance area resistance camp. IF he not show up on map, teleport to city ruin near factory and he should be there. So far i only done this methode twice and both of the time he spawn near the resistance camp. 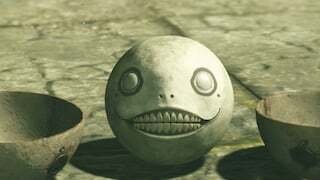 Is it possible to still fight Emil after achieving Ending B? To enter Emil&apos;s real home (not the place with Lunar Tier flowers) you need to speak with him at least once so he says something about how deep he lives. Then you can find entrance to his place inside one of tubes in the middle of huge hole (City ruins), there are not so much tubes sticking out and the one you need is closer to amusement park entrance. When you find the tube and go in, you will se an *exit* elevator and a very deep cave, go deep. Finding his home is not so hard from this point on. If you wanna beat him without leveling too high, you can just build a plugin chip with as many as Vengeance chips as possible and fill the rest with Max HP Up. That way you only need to stock up on your heal items and get hit constantly while spamming Heal; Emil will just slap himself to death. Once you get to the last 1/6 of his health, consume all the damage enhancement consumables possible and focus only on normal attacks, because once his hyper-fast theme starts playing in the background, you have about 90 seconds to finish the fight before he performs an unavoidable EMP that WILL instakill you! So I just won the last secret emil boss-fight (desert) and it says on here you could find a pod upgrade L in his house at this point in the game. There is also another kind of Emil&apos;s Shop. You can buy: Type-3 Fists (weapon), Angel&apos;s Folly (weapon), Dress Module (Key item). With the dress module you can change your outfit (pants vs pantsless) without using self-destruct.